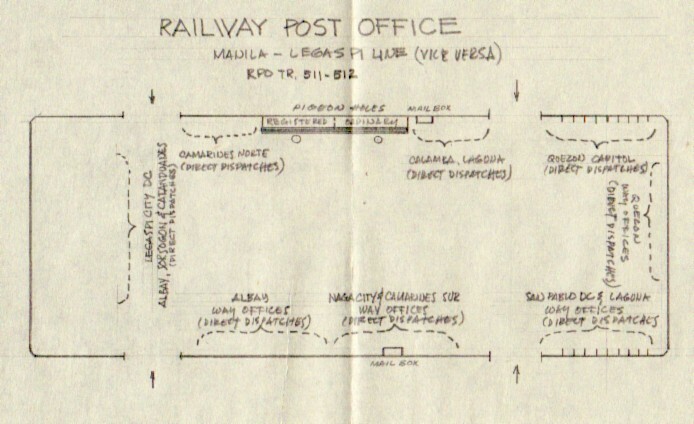 The Railway Post Office (RPO) operates within the mail car which the Bureau of Posts leased from the Philippine National Railways (PNR) on a yearly contractual basis, and thus enables the Bureau of Posts to serve the Way Post Offices along the Railway Lines. 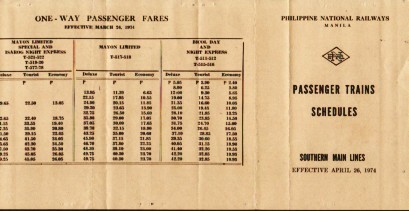 It only operates on the two (2) routes of the PNR - the Northern Line (Manila-San Fernando, La Union), and the Southern Line (Manila-Legaspi City). 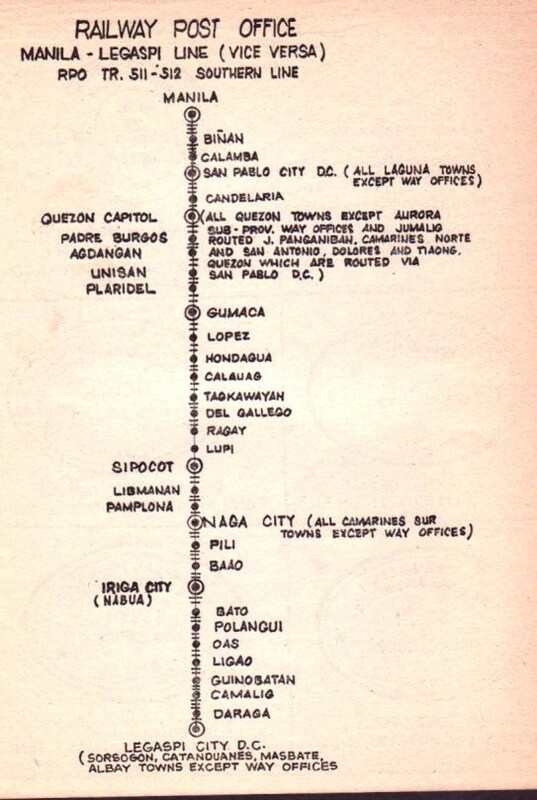 Each trip of each route are assigned with three (3) RPO personnel who board the Mail Car with their specific assigned duties, namely: the Clerk-in-Charge, the Assistant Clerk-in-Charge, and the Helper. 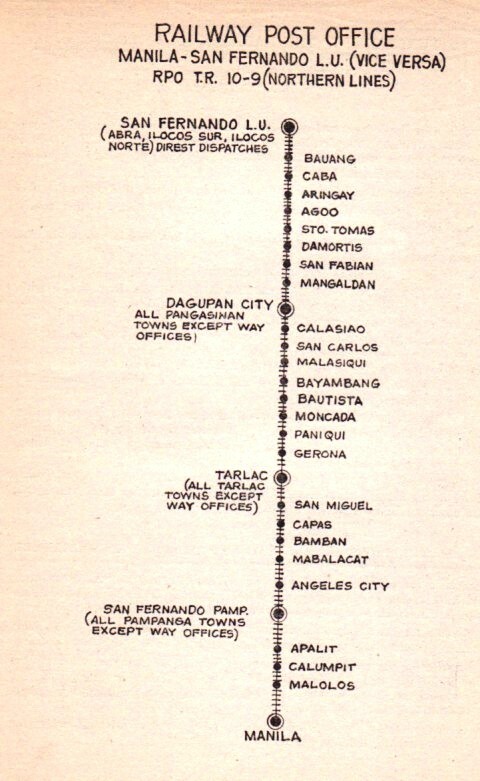 Mails for the Northern Line, being carried by RPO Train 10 include those for the towns of Malolos, Paombong, Hagonoy, and Calumpit, all in the province of Bulacan; the provinces of Pampanga, Tarlac, Pangasinan, La Union, Abra, Ilocos Sur, Ilocos Norte, Benguet, Bontoc, and Baguio City. 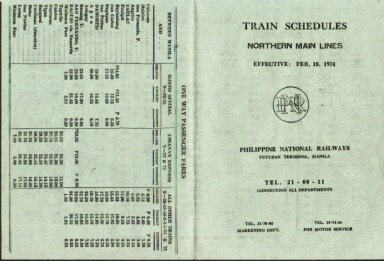 Those for the Southern Line, being carried by RPO Train 511, include mails for all Southern Tagalog provinces along the Railway Lines, for the Bicol Region and the towns of Northern Samar Province and Masbate. But, before they go out on the field, they have to report at the Central Post Office in Plaza Bonifacio to receive the mails for the respective offices of destination as heretofore mentioned. At the Parcel Post Section - Foreign Mail Division of the Central Post Office, every morning the outgoing RPO clerks receive RPO Mail Bags for provincial distribution and delivery. Each of these bags, physically counted and re-checked according to destination, is recorded on Waybill (BP Form No. 104), preparatory to their dispatches to Way Post Offices. 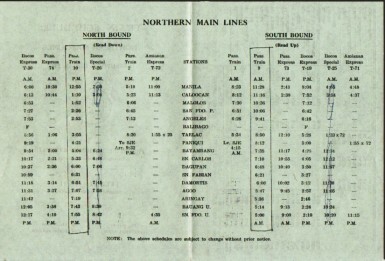 This procedure is routine, whether for the North or for the South bound trips. These bags are usually loaded into the mail truck after they were checked and verified. A copy of the waybill or manifest of the outgoing bags is signed by the three outgoing RPO Clerks. This waybill is then filed at the records center of Region IV for file and record purposes. checks being sent; hence, each envelope is postmarked "Listed Checks". 4. Bundles of Special Delivery letters and packages. At the Registry Unit of DC "D", a mail clerk opens each bag of loose registered matter in the presence of the RPO Supervisor and the Registry Unit Supervisor, counting and verifying on the accompanying Registry Bill the number of each item. 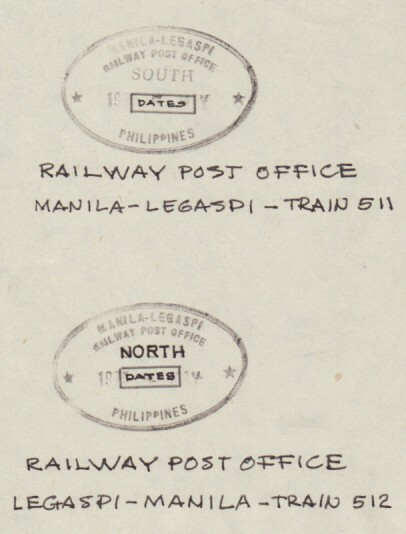 Each mail is back-stamped by the Dispatching Section, Registry Division, Manila Post Office. It should be noted that these bags are sealed and locked using a Rotary Lock, the number of which is indicated on the accompanying Registry Bill on the label of the sack and tag. Master Keys to the said locks are in the custody of the Supervisor of the Registry Unit of DC "D" and the receiving postmaster. A copy of the Registry Bill for such mail matter is provided to the RPO Clerk-in-Charge. 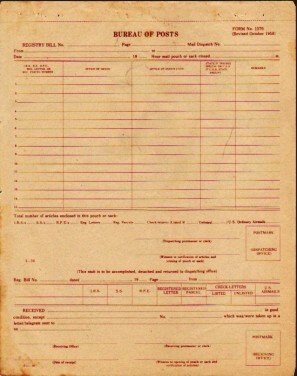 Direct Pouches or Sealed Sacks (S/S) containing ordinary registered letters, foreign and local checks, which are not opened but only verified as to whether the condition of the bags are good or bad, are brought to the mail truck accompanied by the Supervisor of the Registry Unit of DC "D". Each of these pouches is counter checked, counted and verified with the Registry Bill, a copy of which is given to the RPO Clerk-in-Charge. In case such bag is damaged or torn, the Registry Unit Supervisor will have to either change the bag or repair it right on the spot, before the outgoing RPO Clerks could accept them. Marked Seal Press of the Registry Unit of DC "D" is used in sealing each bag, the mark of which identifies the particular sealer and the office of origin. When everything had already been loaded to the Philippine mail truck after all the checking and verifications, the truck then finally goes to the Philippine National Railway Tutuban Station, where the RPO car is located. Inside the mail car of the RPO, we have three personnel working: the Clerk-in-Charge, the Assistant Clerk-in-Charge and the Helper. Mail bags delivered by truck from Central Post Office and subsequently loaded into the mail coach of the PNR are sorted out according to Post Office of destination and piled according to groups and distribution scheme. Registered mail, checks - foreign and local - that are contained in exchange pouches along Way Offices are then opened and backstamped by the RPO sorted out and put on labeled mail bags and sealed again. All mail bags received from Way Offices and mails directly dropped at the RPO mail box, are also sorted out and backstamped by the RPO, and placed in corresponding mail bags and dispatched to office of destinations. The Clerk-in-Charge then accomplishes Registry Bill (BP Form No. 1570) for each post office of destination, marking down the Registry Number, office of origin and destination, remarks, and the total number of pieces per item. The number of ordinary, Special Delivery, and the like are also recorded in the same Registry Bill. Information on mail bags containing ordinary mails are also transferred from Way Bill Form No. 104, listing down the origin, the destination, the total number of sacks and pouches, the date and hour of receipt for each bag. 3. one copy to be enclosed in the mail pouches for signature of the receiving office. The Receiving Officer fills out, signs, detaches, and returns the stub to the office of origin retaining the body of the bill as his record. Should pieces of mail and/or the mail bag be damaged or its contents found missing or lost, a full report shall be forwarded with the waybill to the Postmaster General, and the stub receipt of which is noted, signed and promptly returned to the office of origin. 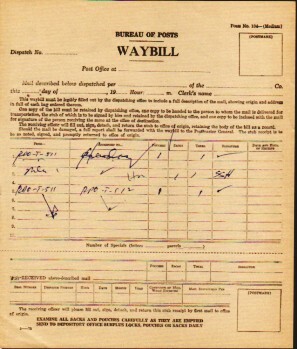 After receipt by the Receiving Clerks of the DSMDC "D" the duplicate copy of the Master Waybill of the RPO Clerks are signed, with the date and time of receipt also indicated-on said waybills. This ends the routine but strenuous work of the RPO. 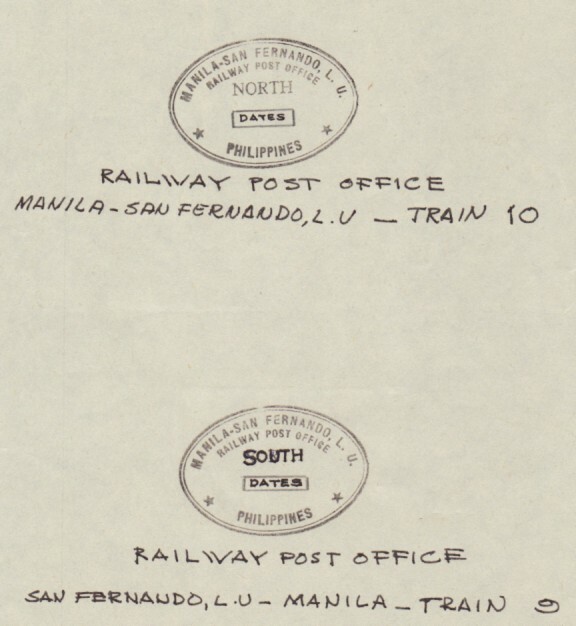 511-512 (Manila-Legaspi) and RPO Trains 10-9 (Manila-San Fernando, La Union) including those handled by the Way Postal Agencies. 2. Supervises transportation of mails by trains and operation of all Railway Post Offices. 3. Makes proper representations with railway officials on matters affecting mail transportation by trains. 4. Acts on payment of claims for the carriage of mails by trains in accordance with the contract terms. 5. Conducts further studies to improve railway mail service. contract with the Bureau of Posts for the purpose. 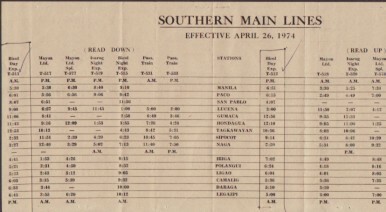 (New schedule took effect March 10, 1975). Bureau of Posts trucks duly assigned for the purpose. be disrupted due to strike of mail contractors or transportation companies, termination of contract derailment of trains or for other causes. emergency use when disruption of mail service occurs. 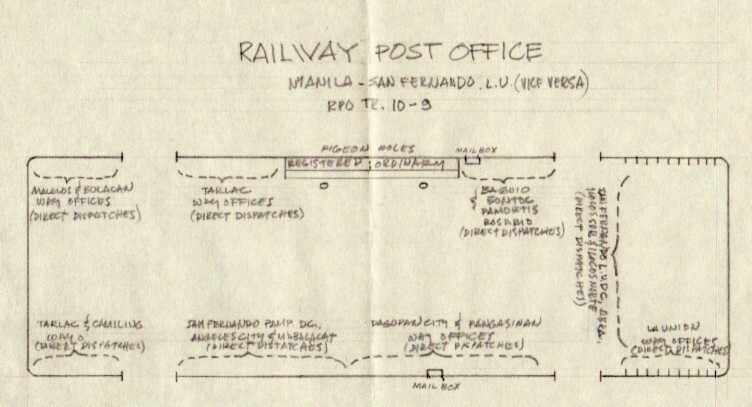 (Manila-San Fernando, La Union), of all mail dispatches from the Central Post Office. the Way Offices along the lines traversed by the RPO Trains and the dispatch of pouches for the Way Offices along the same lines. 4. The Transfer Clerks are responsible for the receipt and dispatch of mails from the Provinces of Cavite, Bulacan and Rizal.